Calahan Elementary School commits to providing an education that unites ethical and academic perspectives in the pursuit of excellence. Emphasizing high achievement, Calahan encourages students to develop their whole being and their commitment to lifelong learning. Calahan maintains a safe and healthy environment in which children feel empowered, challenged, and nurtured. Sports and extracurricular programs emphasize excellence and strength of character. Utilizing technology and the rapidly expanding advancements in the access of information, Calahan prepares our students to be productive citizens in our global society. Calahan commits itself to balancing and integrating its curriculum, to inspiring critical thinking and problem solving, and to creating and energizing continuous learners. Calahan commits itself to model and instill a respect for and an acceptance of others. Calahan Elementary School cooperates with the families it serves to provide a challenging educational program within a caring environment, attentive to the comprehensive development of all students. Children from a diversity of ethnic, cultural, economic, and religious backgrounds come together for an active and varied curricular and extracurricular program. 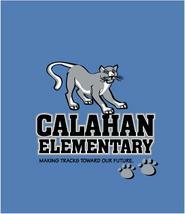 The mission of Calahan Elementary School is to form academically capable, principled contributors to the future. The SAFETY of everyone in the school must be maintained. ORDER is expected for an optimal learning experience. The RIGHTS of everyone in the school must be protected, including the right to an education and the right to have personal boundaries respected. I will be safe, and I will ensure that the physical and emotional safety of others is protected. I will maintain an orderly learning environment, free from unnecessary distractions and disruptions. I will respect the rights of others, students and staff members alike. I will make choices to keep myself safe, and I will help others to be safe. I will be responsible to keep myself in order, and I will help my classmates be orderly. I will respect the rights of others, including personal boundaries, property, and ideas. I will encourage my child to be at school on time every day and will support them to arrive safely and prepared to learn with his or her materials and work in order. I will exercise my right to be involved with and informed about my child's educatiion. I will respect the rights of others, students, and staff members alike.